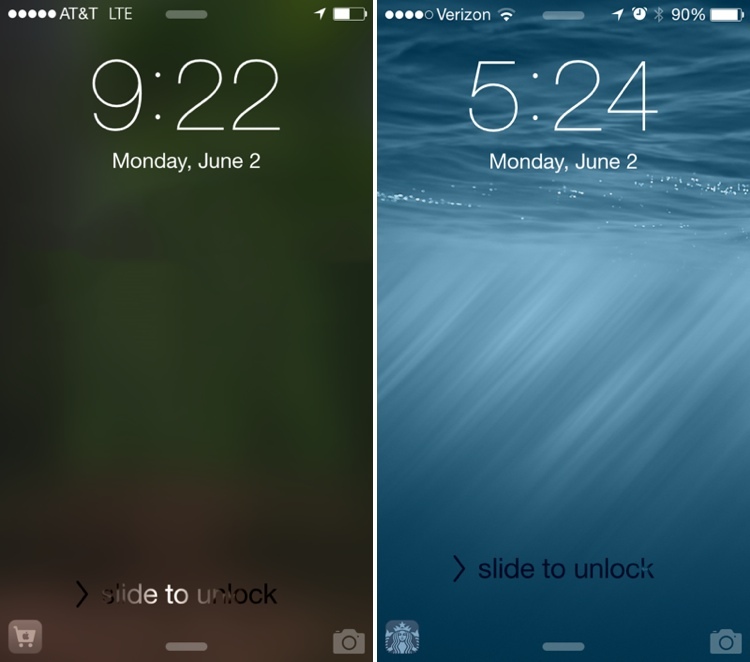 Apple(s appl) has added a new button to the iPhone lock screen in iOS 8. Tucked into the bottom lefthand corner of the screen — across from the camera button — the new icon provides quick access to various apps based on location. So far, beta users have reported seeing the button pop up when they are in an Apple Store or Starbucks, according to MacRumors. The space is typically blank, but if you are in the right brick-and-mortar location, the app shortcut will appear. A user on Twitter saw a Costco button even though he did not have the Costco app installed. While a shortcut to a location-specific app could be extremely handy, especially for payments, two concerns that come to mind. First, this is a form of advertising. While it seems relatively unintrusive at the moment — and to be fair, there’s nothing currently stopping ads from being served as notifications — some people might not want to see corporate logos on their lock screens. (So far, Apple’s implementation seems to be a tasteful compromise: the logos are small and there’s no notification sound, either.) The second concern is related to security: not only does Apple appear to be actively using users’ locations to prompt them to buy Starbucks, but when adding lock screen features in the past, the company has opened up iPhone users to exploits that allow malicious parties to bypass password protection. This feature could either be a super-handy addition to a mature mobile operating system, or could mark the beginning of intrusive lock screen creep. We’ll see when iOS 8 is released to the public this fall. It is not intrusive lock screen creep it is a creepy lock screen intrusion. If this is going to leak away my data quota, I hope there’s a way to opt out or disable it. I suspect that’s something Apple’s not going to overlook. Currently, you can turn off Location Services, so I don’t know why they’d remove that option.